Behold... the Devil's armchair. This creepy bone, horn, malachite, and wood chair seems fitting for Hallowen. 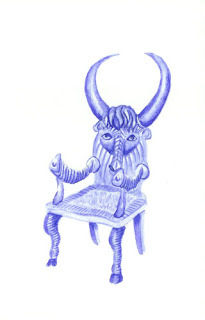 I do like the design of the symmetrical top horns, but I ask you, who would own this evil, scary chair, besides Satan? Seems more like an Ozzy Osbourne stage prop than something one would have in one's living room. The chair was originally made in England in the 1960s and is a one of a kind creation. Thankfully.